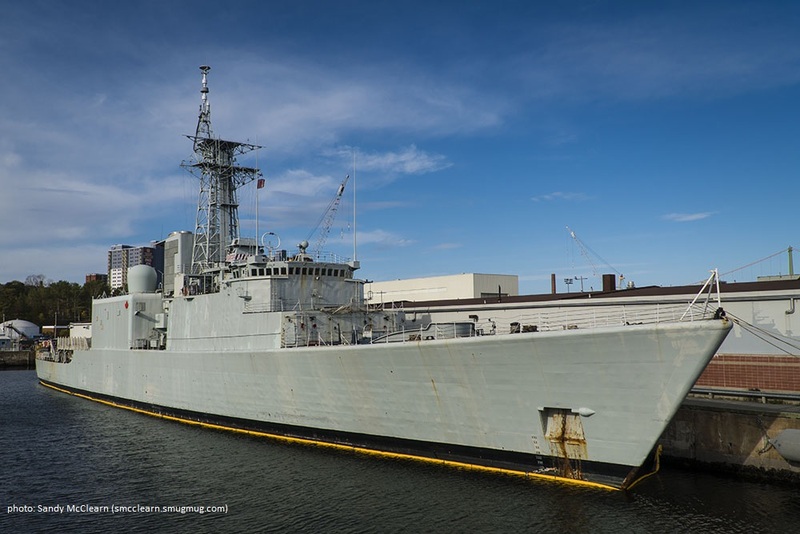 ‘Word on the waterfront’ is that former Her Majesty’s Canadian Ship (HMCS) Iroquois will be towed out of Halifax later this week, bound for Liverpool, Nova Scotia, to be broken up.1 At Liverpool she will join her sister destroyer Algonquin and the naval replenishment oiler (AOR) Protecteur. All three have been paid off, taken out of service from the Royal Canadian Navy (RCN), and are passing through the hands of the Material Group of the Department of National Defence (DND) for disposal. Paid off, the traditional naval term, means that a ship’s company has disembarked, reusable material has been returned to naval stores, and artifacts have been sent to naval museums. The resulting hulk is readied for the breakers. Iroquois’ is a business and economy story, not a navy story. True, there will be a lot of feelings amongst sailors, serving and retired, as they watch the ol’ lady get towed out of Halifax Harbour, hull numbers painted over and no naval flags flying. And there will be comments from ‘shipfans’ who note the lack of destroyers with command facilities and long range air defence missiles, and lack of replenishment oilers, floating warehouses, in a RCN which is and needs to be a blue-water, globally-deployed, forward-operating navy for Canada. But there should be satisfaction that the contract for breaking Iroquois (she retains that name, even if legally she is no longer ‘HMCS’) means more months work for the 30 to 50 men and women who are employed on the Nova Scotia South Shore as a result. Pictures coming out of Liverpool show work on Protecteur progressing well. Algonquin is probably started, and as a destroyer one quarter the size of an AOR (who should provide over 9000 tons of scrap steel and other metals), won’t take as long. 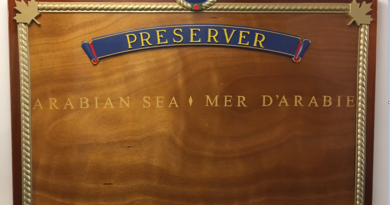 Soon, the former HMCS Preserver, recently paid off sister to Protecteur, will be up for breaking, and as another AOR, will take longer than a destroyer, though the breaker will be by then so experienced that the work may easily go quickly and well. Not much later, HMCS Athabaskan, last of the Iroquois-class destroyers, still in service but old and already with some capabilities removed from her, will be paid off and added to the list for disposal. And there are other large government vessels, such as Canadian Coast Guard Ship Matthew and Canadian Forces Auxiliary Vessel (actually, she is crewed by DND civilians) Quest, that are further opportunities for ship breaking work. There may also be sizable vessels becoming available for disposal and breaking as a result of the Canadian government’s recently announced marine policy, building on the success of motions by Members of Parliament towards getting rid of environmentally hazardous and unsightly vessels abandoned on Canada’s coasts. Congratulations to the ship breaker RJ MacIsaac of Antigonish on their successes. It is hoped that the company, and the workers and supporting companies of the South Shore, will enjoy further success with much more ship breaking work. There is money in ship building, in ship basing, and in ship breaking. It is good to see Nova Scotia benefiting from what looks to be a long-lasting, oceans-oriented, industry.